This week’s Tuesdays on the Run is all about Black Friday shopping codes and discounts and I confess, I’ll be reading and absorbing more than contributing to that topic. 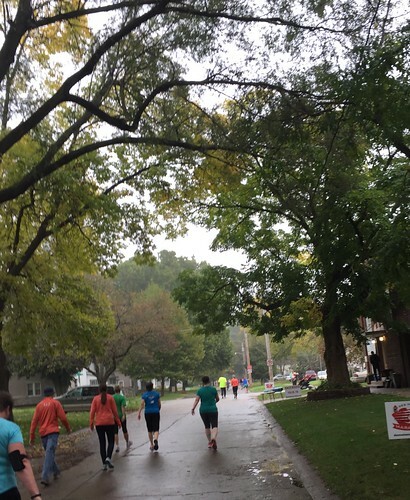 Instead, I thought I’d take advantage of the chance to give you a recap of the last of my run of half marathons this fall: the Good Life Halfsy in Lincoln. Thanks as always to Patty, Erika and Marcia for hosting the link up. Be sure to check it out for deals! 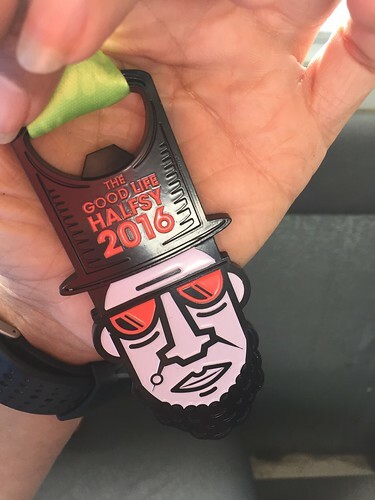 I registered for the Halfsy because it was the same weekend as I was scheduled for a 15 mile run and I was a little nervous about my first real marathon training run. 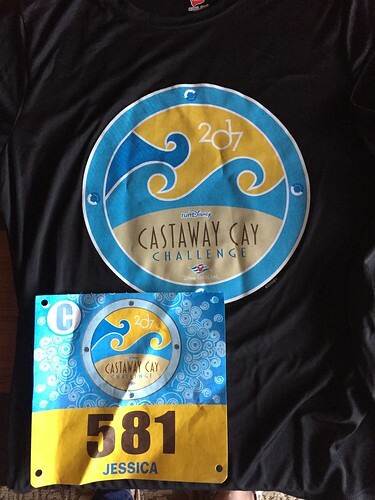 I figured running a new-to-me race would be a nice distraction from “holy cow I’m running 15 miles!” nerves. The race was in Lincoln, which is about 45 minutes from where I live, and offered packet pick up the morning of the race, which is always a perk. I drove out early (tip: Allow an extra 15 minutes or so to get to races because you never know when you’ll run into traffic from all of the other racers as you get near the race start!) and picked up my stuff about an hour before race time. I then headed out into the neighborhoods near the starting line to get in a couple of miles before the race start. This was a point to point course that started at a local high school and finished downtown. The course is billed as “fast” because the overall course is net downhill. That’s technically true, but it’s Nebraska, so there were still some hills. The worst of them were in the first half of the race and we had lots of nice flat stretches too, so it wasn’t too bad. This was also a very walker and slow runner friendly race, with lots of people stretched along the back of the pack. Course entertainment was just that . . . entertaining – and odd. This race is sponsored by Pink Gorilla Events, which run a few of our more party-like races in this neck of the woods. There was the requisite Pink Gorilla at the start, as well as bands, random costumed cheering squads, dragons and loads of little kids out passing out high fives. All in all, I enjoyed the distractions along the course. The course wound through some Lincoln neighborhoods as well as a couple of nice park sections. 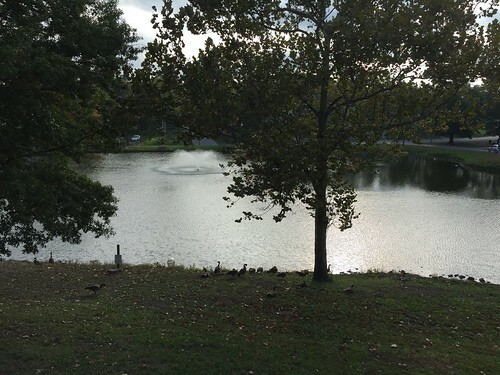 I enjoyed a little run around a lake, as well as long stretch along a waterway and park downtown. 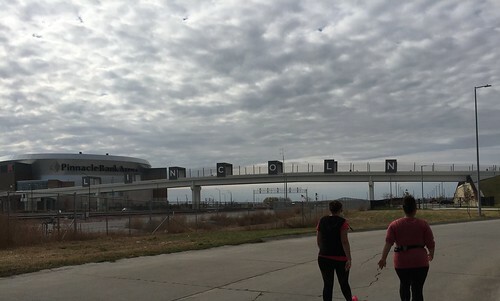 I don’t visit Lincoln often and found myself enjoying this little tour more than I remember enjoying the Lincoln Half Marathon back in the spring. Of course, “mostly flat” is never entirely flat and this ended with a killer bridge at the end! The bonus is that is the feeling of a flying, fast finish as you come down off of the bridge and into the finishing party zone. The drawback: getting up that bridge to begin with. There were plenty of drinks and snacks at the finish, which I always appreciate, and I have my first ever functional medal: A beer opener! There was also apparently beer somewhere in the finishing area but as I had a) a bus ride back to the starting line and b) a hour of driving still ahead of me, I immediately headed out after I was finished. 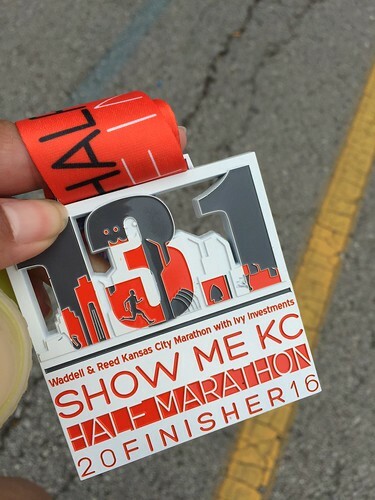 All in all, this race felt like a lot more fun than the Lincoln Half Marathon in the spring. I’m not sure if it is the party atmosphere Pink Gorilla tries to build or the fact that my mind is in a laid-back, finish-it kind of mode as opposed to chasing a time goal like I was back in Lincoln. Regardless of the reason, this was a fun race that I’d definitely run again. What do you prefer – loops or point to point races? I like the point to point in theory – until I have to ride the bus back to the start! I travel a lot for my job (currently in Bethesda Maryland!) which means I get to run in a lot of different places. It definitely makes it easier to check states off of my 50 states running list. 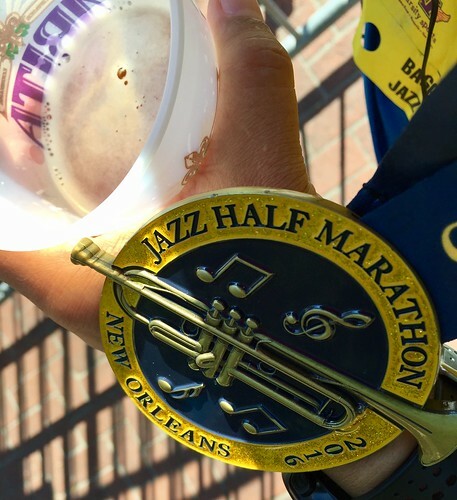 🙂 I went to New Orleans in October for a meeting and took advantage of the timing to run the Jazz Half Marathon. In addition to getting a new medal, which is always a perk, it gave me a nice way to get in that week’s long training run. Win win! The expo for this race was very small and set up in a hotel meeting lobby. 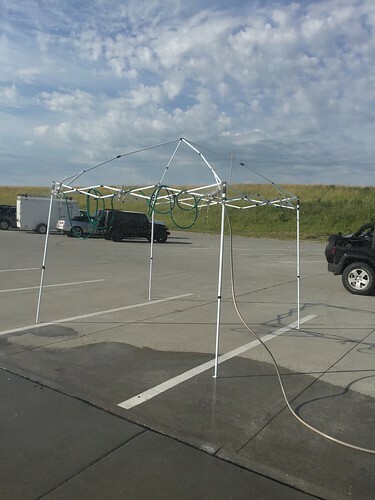 It made things very quick and easy to navigate, but it also meant that you wouldn’t have the chance to pick up any last minute things you might need. Always a concern if you travel for a race! I was out of Nuun and hoping I could pick up an extra tube at the expo, but had no such luck. Lesson learned: When you travel for a race, be sure you have all of your essentials with you. Regardless, it was great to be able to pick everything up and be out again within 5 minutes. My biggest challenge on race day was that I nearly went to the wrong location! 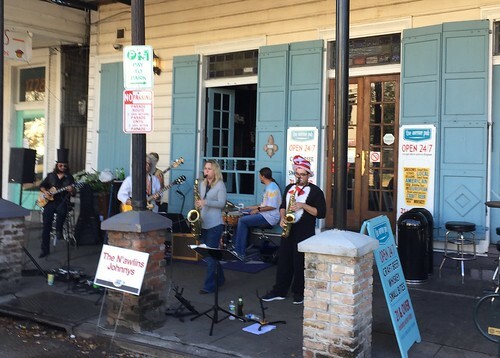 This was totally on me, not the race itself, but Jackson Square (which was what was stuck in my mind) and Lafayette Square are two entirely different places. Oops! 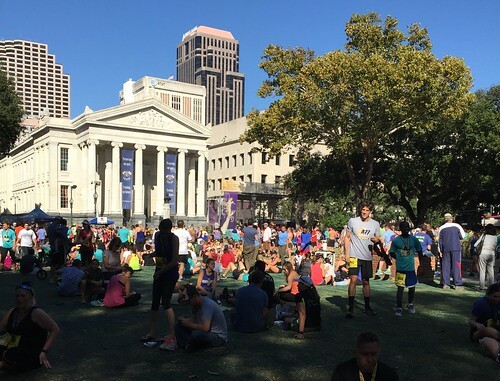 I ended making it over to Lafayette Square with time to stop in the lobby of an office building for a real bathroom break (always appreciated) just before the race started. There weren’t any set starting corrals, but as the race wasn’t huge, that wasn’t a big problem. The 5K and half marathon runners were all mixed in together at the start, but the directions for the split were clear later on. 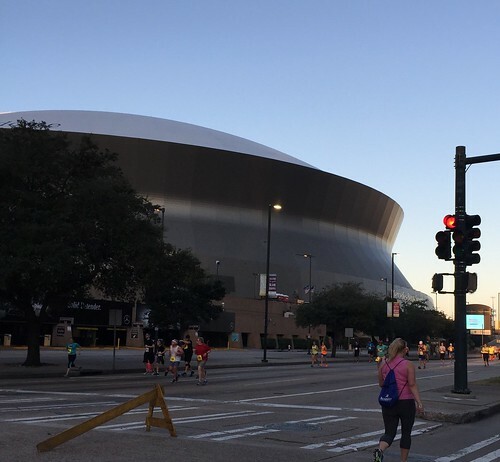 The first three miles ran through the business district, circling down by the convention center and up near the SuperDome. It was really flat, which is great, but the road was also a little tricky in places in terms of surfaces. 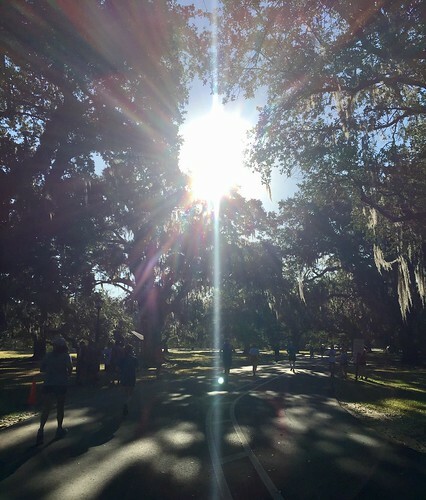 As we approached 3 miles, they had a clearly labeled split point for the 5K runners to peel off and the rest of us headed out to St. Charles Avenue for my favorite stretch of the race. 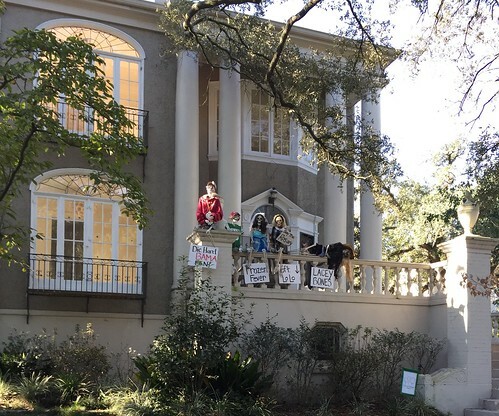 I loved seeing the architecture and the Halloween decorations through the Garden District. After a few miles along St. Charles, we had a nice loop through Audubon Park. While I’ve been to the zoo in New Orleans, I’d never actually been in the park. It’s lovely! It was also nice to see so many families out in the park. The Louisiana girl in me is also a sucker for Spanish moss. 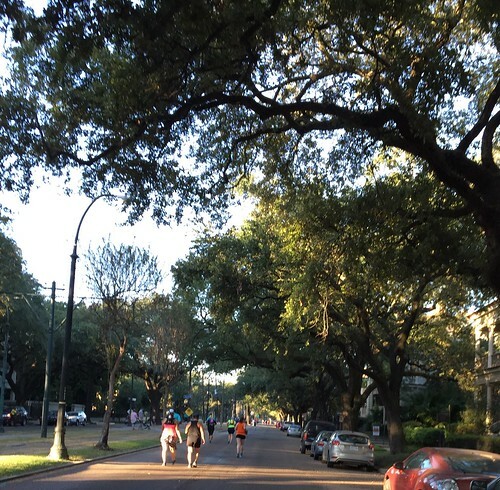 The trip back up St. Charles Avenue was a lot less shady than it had been earlier and I was definitely tired after too many late nights (and too much alcohol), but I kept putting one foot in front of the other. One disappointing factor for the back of the pack was that the bands that were out for the first half of the race had packed up by the time we came through. I could have really used the distraction! I will say that I had a personally nice little moment at the finish line. Some one I’d passed came up near me again and a couple of blocks out from the finish, I decided that I wasn’t going to be passed. I picked it up and left her in the dust (relatively speaking of course). As slow as I’ve been running lately while I’ve focused on longer distances, it was sort of fun to pick it up for a while and see that I could still do that, even at the end of 13 miles. There weren’t nearly as many costumes as I was expecting for a Halloween weekend race, but given the heat and humidity that was totally understandable! I definitely recommend this race as a great way to see a different, non-Bourbon street, view of New Orleans. I ran the Des Moines Half Marathon for the third time this weekend, this time with the added twist of the I-35 challenge thrown in the mix. 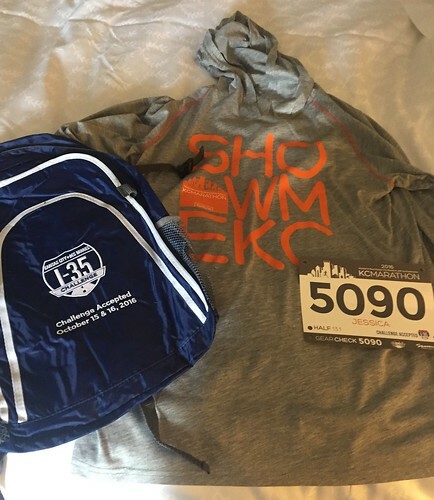 After finishing the Kansas City Half Marathon on Saturday, I cleaned up and we grabbed lunch before heading out for the 3 hour drive to Des Moines. It’s not the most exciting drive – I took a nap, drank lots and tried to stretch out my legs. After doing packet pick up in Des Moines (quick and easy! ), we checked into our hotel and settled in for a evening of rest, rolling and some yoga stretches. I like this year’s shirt color – my favorite so far! Very fall appropriate. 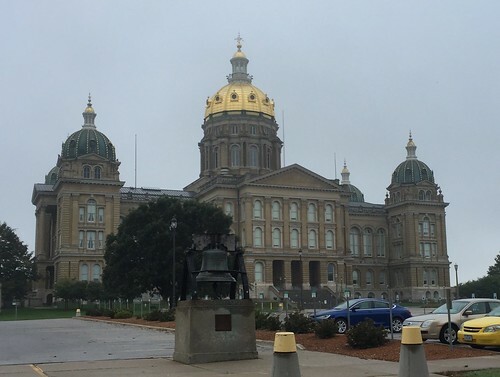 One of the nice things about the Des Moines race is that it starts at 8 am, so you don’t have to wake up super early. I had time to go down to the lobby and grab breakfast. One of the invited Kenyan runners rode down with me and I told Darrell I was a little tempted to follow her and pick all of the same foods for breakfast. 🙂 I have a feeling there’s a little more than breakfast choice that influences her race success compared with mine. I confess, I assumed that I didn’t need to look at the course maps or anything because it had been the same course for the previous two years. It wasn’t until I headed out of the hotel and realized that everyone was walking in a different direction than I was that I realized maybe something had changed. It turns out, lots of things had changed. The start and finish weren’t on the bridge like it has been in years past, thanks to some construction. Another difference this year was the assignment of runners to corrals based on the projected finish time. It didn’t look like they were rigidly enforcing the corrals, but I didn’t challenge it. I actually lined up in the back in the “un-corralled” group because I was planning on taking my time. They got all of the corrals off in quick succession and I do feel like there was less jockeying for position since I was more closely grouped with people of the same pace. The start was a little confusing, in that we first moved across the 5K starting line and everyone turned on their Garmins to start racing. 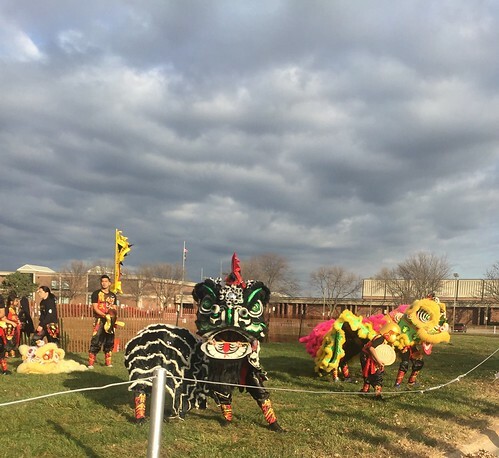 We turned a corner – and there was another starting line? Again, read the race day packet. A map of the starting line was probably there and fewer of us would have been confused. Turns out, there was a 5K start line and a half marathon/marathon start line. Similar to the last two years, we spent the first two miles in town (although a different path through town) before the half marathon split off from the marathoners. As always, that split was well signaled with lots of volunteers pointing you in the right direction. In years past, we spent several miles running through parks before heading back downtown for the last couple of miles. This year, we only did a loop of Gray Lake before heading back to town, which meant lots of town time. 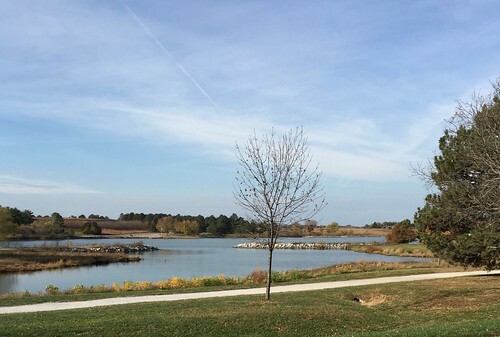 I do enjoy the park and lake time because they’re flat and gorgeous in October. I also find the asphalt a little easier on my feet as opposed to the concrete of city streets. The only glitch in the race for me, which was overall extremely well supported like always, was the fact that we didn’t get any kind of aid station until well after mile 2. It was insanely humid all morning, so I was grateful for having my own water bottle. Not only did we go quite a while before getting an aid station, but that poor aid station was having a really bad day. It was a huge mess. They only had water – no Gatorade refilled – and not much water at that. Fortunately, that was the only glitch with aid stations and support. After that, it felt like there was an aid station every mile and a half or so. All of them had lots of enthusiastic volunteers, plenty of fluids and fuel at several stations (gels at two stops, bananas/oranges/candy at others). After we left the park, we had a trek through some boring city scenes (sorry Des Moines!) as well as some nice, friendly neighborhoods, with trees and spectators out in their yards. It was also in this stretch that I came across a bacon aid station. 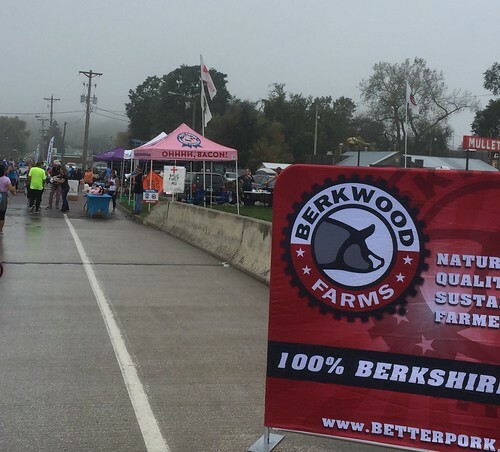 Yep, they were handing out bacon at mile 9. I passed. 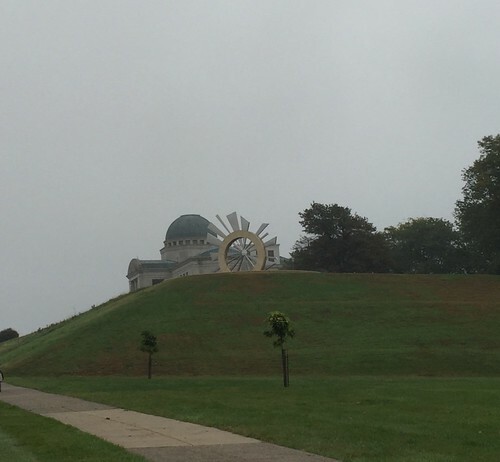 Not only did the course change take out some lovely park time, but it added a heinous and huge hill at the Capitol building. The capitol and judicial buildings were lovely, but I’m not sure it was worth that massive hill at mile 10. There were also a couple of out and back loops in the last four miles, which is never a fun to pick up miles. All in all, I was exhausted and it was the least fun part of the race. Yuck. As I was coming through mile 12, I was weirdly emotional about this whole thing. I was almost done with my second half marathon in two days. 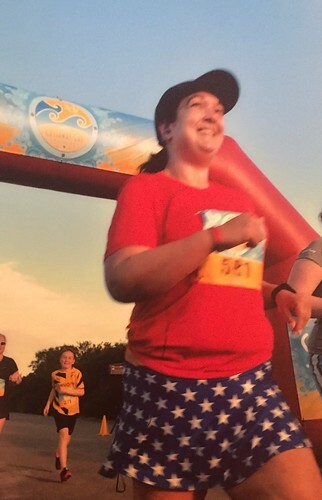 It’s been less than 3 years since my first half marathon and about 4 years since I decided to start losing weight and taking control of my health. It amazing to me how much my life has changed and it was because I decided to do it. There’s more to it than the decision of course – I’m blessed with a supportive family and the financial resources for healthy food – but it started with me. It started with the decision. Thankfully, as I was about to break into tears, Darrell texted met to tell me he was at mile 13 with Oliver and Oliver wanted to run in with me. For so many reasons, that 0.1 miles was the best of my life. 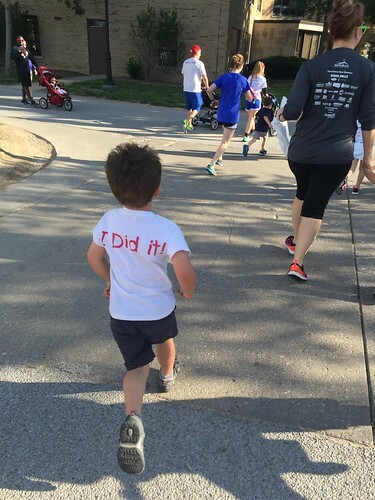 Oliver is such a huge motivation to keep running, to keep making healthy choices and so finishing that huge challenge hand in hand with him was beyond words. Still get goose bumpy thinking of it. 🙂 I was honestly a little worried I’d be disappointed to run this course slower, because I PR’d here last year, but it was an accomplishment just to finish this! My time never really crossed my mind. After the end of the race, we grabbed medals and pics and a piece of pizza. I love that Oliver told me that his heart was beating fast. No kidding, kiddo. I hope the course goes back to its prior route after the construction downtown, but regardless, I love the support of this course. The spectators and volunteers are fantastic and always enthusiastic. I’ll definitely be back to run this race again! Do you have a race you come back to over and over? 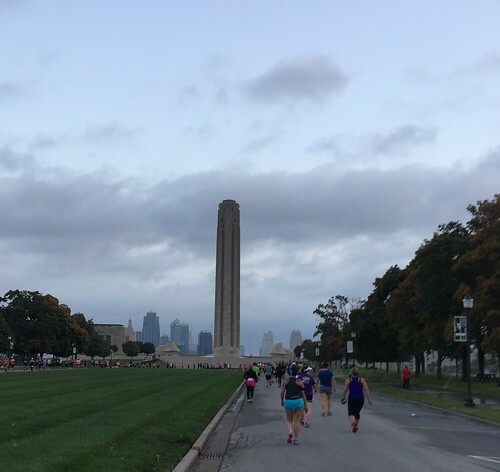 Since I just checked off a big running goal for the year by completing the I-35 challenge, I thought I’d talk today about the first race of the challenge (Kansas City half marathon) for this week’s Tuesdays on the Run. Thanks as always to Patty, Erika and Marcia for hosting. 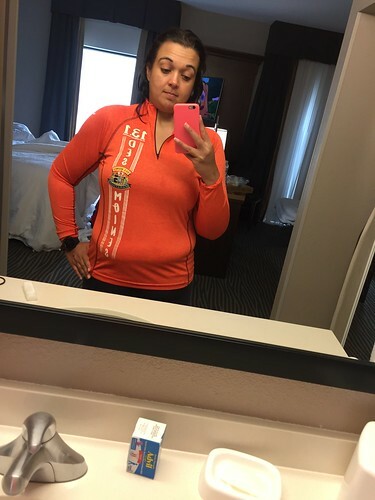 Be sure to check out the link up for everyone else’s progress on their running goals! I was able to walk out from my hotel to the starting area, which was a little park space full of tents and music and loads of people. They had projected pace signs so you knew where to line up and everything went really smoothly with the start. There were even a couple of little fireworks at the beginning! 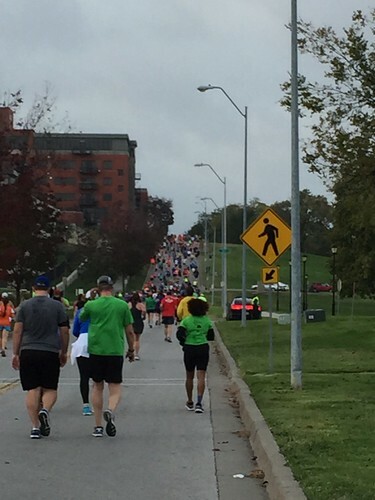 I knew the Kansas City course was reputed to be hilly and boy was it ever! I felt like I was going either uphill or downhill for at least 75% of the race, with very little flat ground. 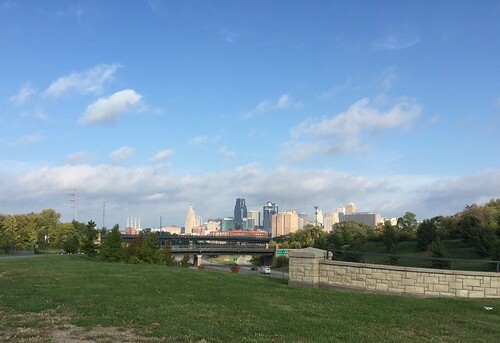 However, I felt like this course did a great job touring us through Kansas City so that we really got a feel for the town. 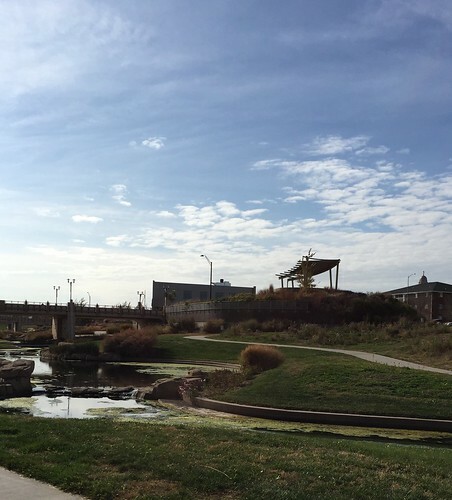 We went through some lovely parks and some funky downtown neighborhoods. 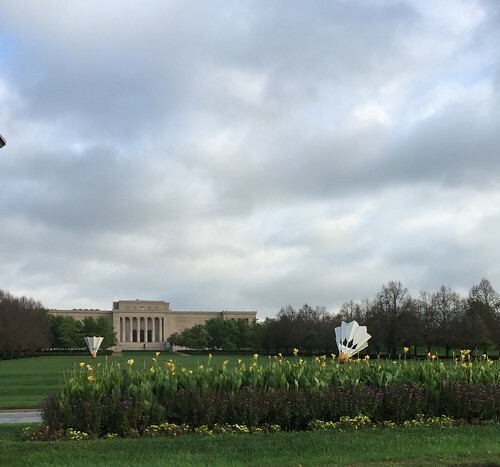 I loved running past the art museum. The outdoor sculpture garden looked amazing and it is definitely on my must-see list next time we’re in town! We ran through the Country Club Plaza area, which is a swanky little shopping district, and I envied everyone on the sidewalk cafes with their coffees. Thankfully, the weather wasn’t too bad. For the first hour, the humidity was pretty miserable but after that, a breeze started and the heat wasn’t nearly as bad as I expected. I kept my pace slow (14 minute miles were my target) and walked the hills. I reminded myself over and over “doing this again tomorrow!” so I didn’t get frustrated with my pace and overdo it. 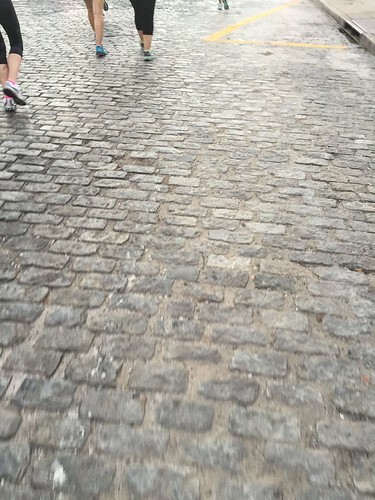 Because this course is for both the half marathon and the marathon, it’s very back of the pack friendly for people who are running or walking slower half marathons. There were plenty of aid stations and they were well stocked every time I came by. 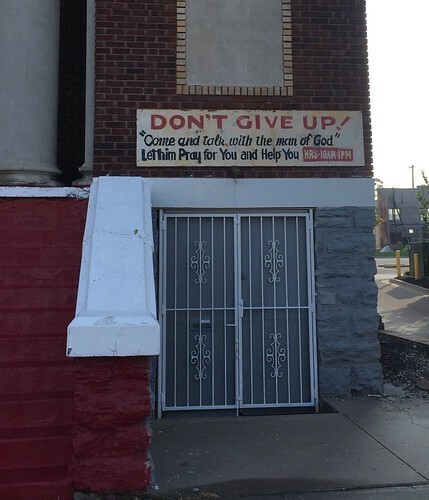 I particularly appreciated passing this church in the last mile of the race. That message seemed appropriate – I was ready to be DONE. Darrell and Oliver were waiting at the finish, which is always nice and there was no clogging of runners in the finishing chute. Everyone quickly moved through, got their water and their banana and passed into the finishing “festival.” There were tons of people and booths in the finishing area and even some things for kids to play with, like those blow up hamster balls. There were also apparently sandwiches and beer for the runners, but I could never see where those were among all of the people. I really wish that had been better labeled or that those were near the exit chute so it was easier to find. I missed out on both a free sandwich and a free beer. Boo. The hills would make this course a a challenge all on its own, without the I-35 challenge component added, but I really loved how they gave you a bit of a tour of the city. I can’t promise I won’t be tackling this race again, but I’ll be training specifically for those killer hills. Have you ever done a running tour of a city? I’ve heard of them, but never tried it. This race definitely felt like one of those! 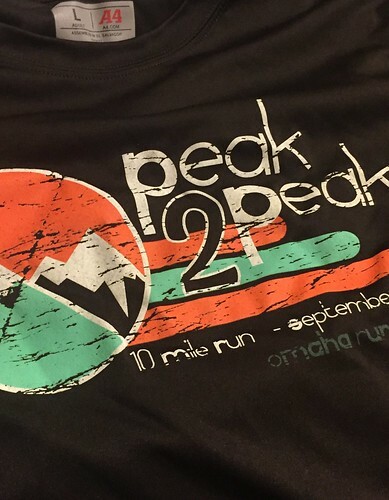 Earlier this month, I ran the Peak 2 Peak 10 mile race for the third time. This is my favorite local race by far. It is usually right about the time our weather starts to turn into fall, so it feels like a nice celebration of cooler weather. The course is fairly flat and ten mile races are weirdly fun (and convenient in half marathon training!). The real reason I love this race, though? The people are FANTASTIC. The volunteers on the course are unfailingly cheerful and helpful. 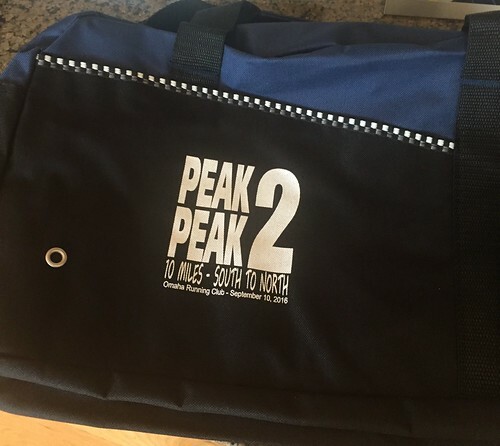 The packet pick up and pre-race communication are always prompt and thorough AND we always get interesting goodies other than just a shirt and medal. I love the graphic and fit of this year’s shirt, but it’s a dark brown which is definitely not my favorite. This brown girl doesn’t generally wear brown – just doesn’t look good for me. My plan for this race was simple: slow and steady, enjoy the miles. I had these 10 miles on Saturday and another 9 coming Sunday, so I had to remind myself over and over not to get caught up in the thrill of the race or I’d regret it the next day! Of course, taking that approach meant I was very quickly left at the back of pack and alone for large sections of the path. That actually wasn’t bad at all – very peaceful – and I did get to see a lot of the other runners because of the looping nature of the course. The guy who won the race (in less than half the time it took me to run it!) congratulated me and cheered me on every time he saw me. Half the runners who I passed at some point on the course said “Hi” or “Great job” and those who didn’t say anything smiled or waved. 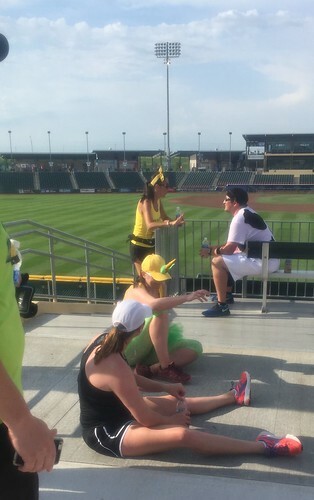 That friendliness is one of the best things about the Omaha running community and this race in particular. One of the most interesting runners I spoke with was this woman, who ran the whole 10 miles in flat fashion-y sandals. They had a leather sole and fabric straps. She said she’d trained for the whole time in these sandals and really appreciated that her feet didn’t get hot. I can’t imagine that, but it speaks to how important it is to train as you plan to race, because it preps your body in a lot of ways. I finished in 2:17:12, which is much slower than my prior times in this race, but well within my pace goal for my back to back half marathons so I’m pleased with it. Every race has different goals. 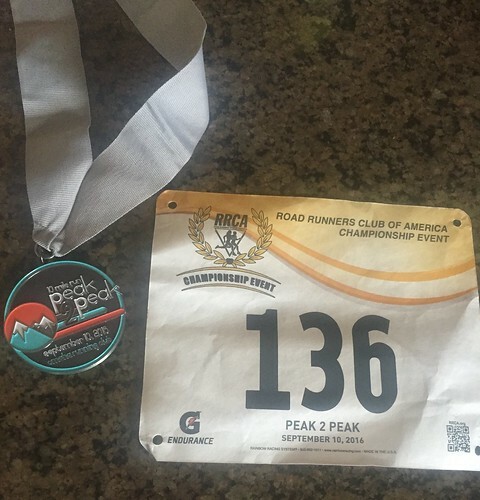 While I didn’t love the shirt, I LOVE the medal (even if Peak 2 Peak in now way involves mountains) and I love that this race gives medals, which makes it a great race for someone wanting to celebrate their first double digit race. 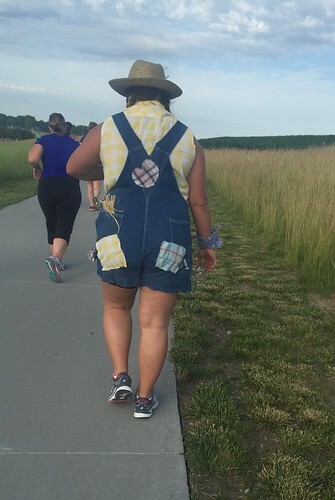 What’s the most unusual thing you’ve seen someone wear in a race? I definitely stayed around to cheer for the sandal runner as she finished because I’m just in awe of her feet! How much more Nebraska can you get for a race title, right? I got suckered into running this race by too many Facebook ads about how quickly it would sell out. I figured a) if it sells out, it must be fun and b) having a race on the schedule in June would keep me running at least a little bit. I totally forgot about the fact that at 7:30 on the last Saturday in June, it would be hot, especially during this hotter than usual period we’re having here in Nebraska. With the heat in mind, I had no goals for this race other than finishing without overdoing it in the heat. I wasn’t too worried about finishing last because this race was put on by the same group that did the Leprechaun Chase 10K I ran last spring, which attracted lots of costumed runners who were there for beer and a good time. As this race also had a costume contest and beer at the finish on a Saturday morning, I was fairly confident it would be a similar event with a nice mix of speedy and not-so-speedy types. This group does a good job with their race coordination. 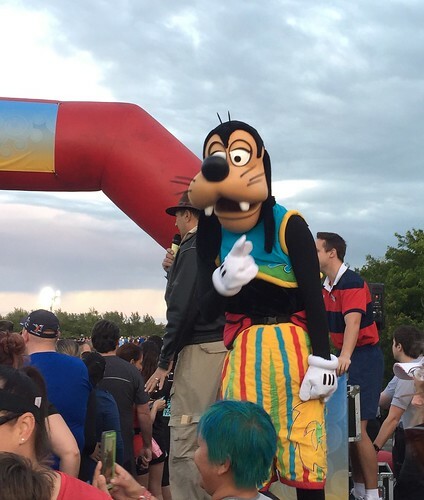 We got great information in the week before the race about when to arrive, parking, managing the heat and the details of the costume contest. They’d planned for 4 water stops, plus bottles of water and snacks at the finish but also advised you to consider bringing your own water as well. I appreciate a race group that acknowledges the risks of summer running! Fun costumes! Corn talking to a cow seems very Nebraska. There were 1750 runners and I settled into my place toward the back for an easy run. The first mile was HORRIBLE! The first mile is always horrible isn’t it? 🙂 My knees hurt, I had a weird pain in my hip and the way the first mile was laid out, we ran in a little spiral of ever widening loops around the baseball field that served as our start and finish. That meant that I could easy drop out and get back to my car without anyone noticing. Not that I considered that too much . . . .
Mile 1 always lies. By mile 2, all of those aches and pains had fallen away and I was left with the “joys” of a sunny, hilly, hot Nebraska run. There was a breeze occasionally, which was nice, but the sun was brutal. I didn’t have my Garmin on and just did a little run/walk mix of however I liked it. I had a lot of fun chatting with people at the back of the pack, cheering each other on and cheering for the faster runners we could see occasionally looping near us thanks to the layout of the course. 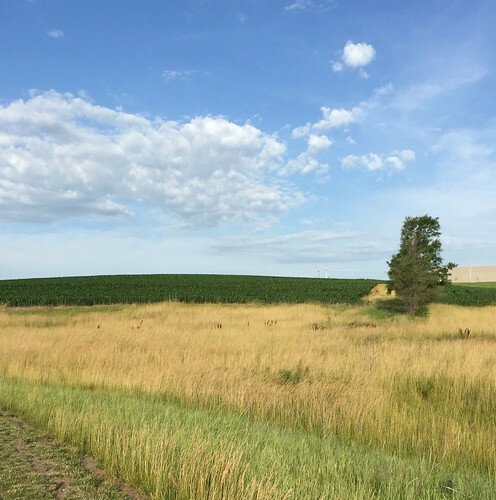 There was definitely at least one corn field and DEFINITELY cows somewhere nearby, if the manure smell was any indication (although I suppose that could be used as fertilizer too). There were people in costumes occasionally, too. There was also a much appreciated sprinkler at mile 4! At this point in my running life, I know how these “easy” races go. I get passed by lots of people in the first mile, settle into my little rhythm of running each mile a little quicker than the last, and slowly find myself passing all of those people who passed me. There was one hill where I stopped to walk and someone said “Keep running! You can do it!” I won’t lie to you guys – I passed her at the end and enjoyed it. I’m sure she meant well but that always grates my nerves in a race. You do you, I’ll do me. The race finished with a loop inside the baseball field, which was sort of cool, except they didn’t tell us that ahead of time and it was confusing to get to the 6 mile marker and not see the finish line at all. One person next to me asked me if we were just finished, so something pointing to the finish line would have helped I think! Water was plentiful and cold at the finish, thankfully, but I skipped the watermelon and corn and beer because waiting in line held zero appeal. I will definitely be following up on social media, however, to see who won the costume contest. I hope it was the farmer girl because I am seriously impressed that she ran in that! My finish time was around 1:26, but since it was over 80 degrees the whole time and I very wisely treated this as a good time rather than a race, I’ll take it. I got my miles in, had fun chatting with people (strangely, races are the only time I feel like I can easily talk to strangers!) and learned about the Chicken Show in Wayne NE (can’t promise I won’t be going to that!). All in all, a good time, a comfy shirt and I got 6.2 miles in. 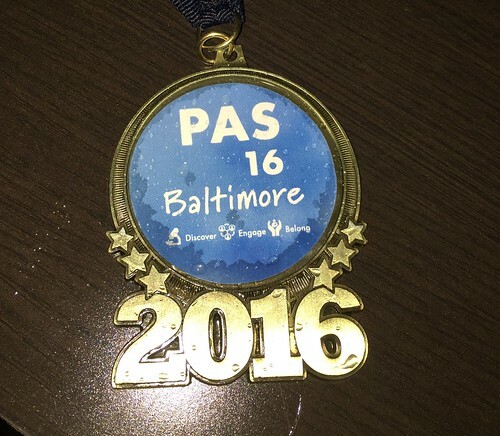 Definitely a win – but I think in the future I’ll stick to cooler months for races over 5K! Have you ever considered dropping out of a race in the first mile? I was proud of myself for resisting the urge, but between the heat and the aches and pains I was seriously tempted! Mile 1 lies! I’ve felt “off” on my schedule all week thanks to the holiday weekend, so of course we’re doing Tuesdays on the Run on Thursday, right? Right. We’re all flexible here. 🙂 This week, everyone has been discussing favorite races close to home and the Boys Town Memorial Run definitely fits that for my family. I highly recommend it if you’re in Omaha for Memorial Day weekend! This was Oliver’s very first race a few years ago (race report here) and he and I have both run this weekend together for the last 3 years. 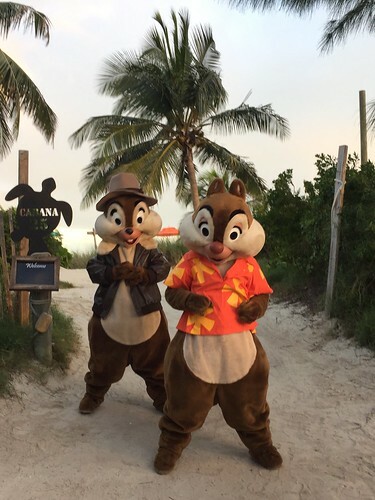 It’s a great family event, so there’s always a lot for Darrell and Oliver to do (face painting, balloon animals, snacks, dancers, meeting Batman!) while I do my run and while we’re waiting between races. The morning starts with a 400 meter kids race, which O rocked this year! He ran the whole thing and ran it hard! There were places he was moving so fast between people that it was hard for me to keep up. This kids race is absolutely my favorite part of this event. The crowds are so supportive, packing the finishing area to cheer the kids along. I love how much fun Oliver has and how proud he is of himself. 🙂 The kids get a ribbon and a bottle of water at the end, both of which make O feel like such a big kid. Wow he’s gotten so much bigger than he was the first we did this! The best motivation ever to keep me and him healthy for years to come! After the 400 meter, there is a 1 mile run. We haven’t done this yet, but next year O is going to step up to this event so I’ll be sure to update you then. The 400 meter is a flat little course through campus, but I suspect the mile will be hillier. Speaking of hills, there’s the 5 mile race. Holy cow is it hilly! You’re almost constantly going up or down hill – there’s very little flat land. There are always big stretches without shade, which can be brutal at the end of May. Despite that, I always enjoy this run. There are water stations staffed by lots of kids. There are people cheering in several places through the course, but especially along the finish (even at later times in the race when I finish!). 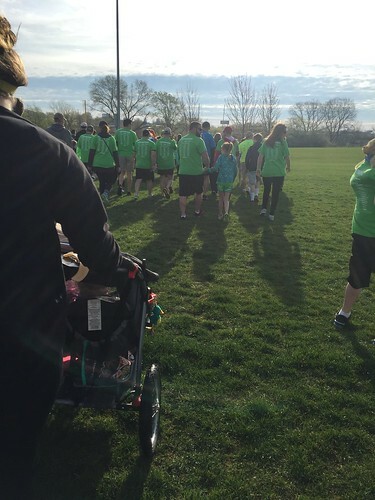 There are lots of families out together running, walking and strollering on the course, as well as on the sidelines. The participants range from speedy types to walkers, so you don’t feel out of place no matter where you are. This year, I had a great time cheering and coaxing a couple of pre-teens along with me in the last mile (which includes a nasty subtle uphill stretch). It’s worth it for the finish line and all of the people waiting for you there. My houseguests for the weekend all ran the races with us and can attest to a) the difficulties of the hills but b) how much the fun of the whole event makes it all worth it. Definitely check it out (and look me up!) if you’re in Omaha on Memorial Day weekend! PS #2: My time this year was 62 minutes, which was faster than I was expecting given how much slower my Papillion Half Marathon was than I was expecting! It was a little slower than last year, but not the 65-70 minutes I was expecting with the hills and heat. 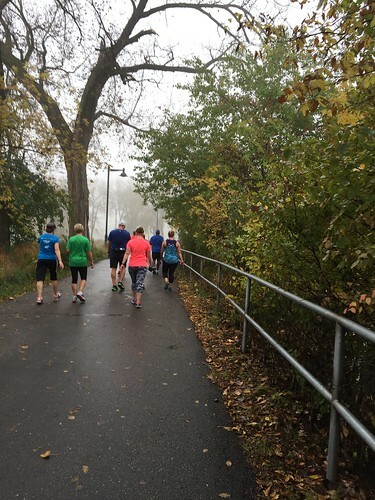 This week’s Tuesdays on the Run topic is whether or not you’re a “one and done” or repeat runner of various courses. I’ve done both and there are advantages and disadvantages to each. Thanks as always to Marcia, Erika and Patty for hosting our link up! 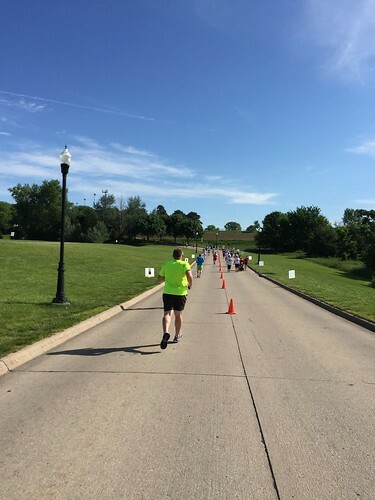 This weekend, I ran the Papillion Half Marathon for the second time, with an identical course for both events. A definite advantage to knowing the course was knowing that the last mile was uphill for over 50% of it. Yikes. 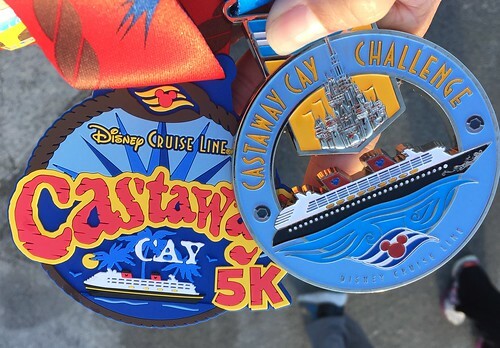 I came into this race without any big goals other than to have a good time, as I took this training cycle a lot less aggressively than I have for my last two half marathons. I knew about the hills, so I trained to run those, but other than that, I just took this race on as a way to keep moving through the lingering winter and early spring. My only goal was to have a good time, which I did. Like I talked about yesterday, my race was a little complicated by unusually bad allergies and the medications I needed to keep those at bay. On top of that, I don’t think I drank enough Saturday or during the race Sunday – especially with the added dryness from the allergy meds! 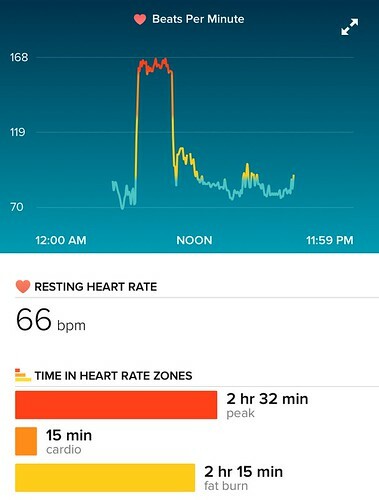 I think that might explain the fact that I felt like I was working HARD (and my heart rate was way higher than usual for the pace I was running) even though I was running slower than I expected. However, I did meet my last minute goals I’d set on the drive to the race: Pass a lot of people at the end and kill the hills! It was a gorgeous day, which also added to the overall enjoyment of the day despite the fact that I felt like the race was much tougher than I expected. My sore quads two days later can attest to the fact that I worked hard to kill those hills. This year, I finished in 2:46:51, about 5 minutes slower than last year, but I’m very satisfied with my effort all in all. I knew the course, so I knew where the hills were. I knew the kind of support that would be available, both in terms of spectators (few, but dedicated) and aid stations (well staffed!). I knew exactly what the finish was like. Those things helped me mentally, in terms of visualizing the finish, and in training and preparation for the race. 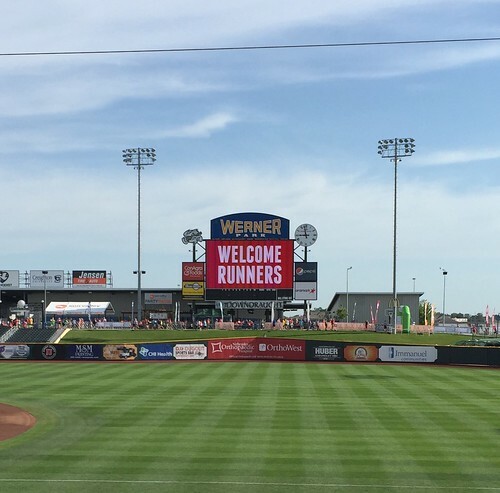 It was the same with the second time I ran Des Moines – the familiarity can be good, especially for a PR. There were, however, a couple of disadvantages to running this course again. 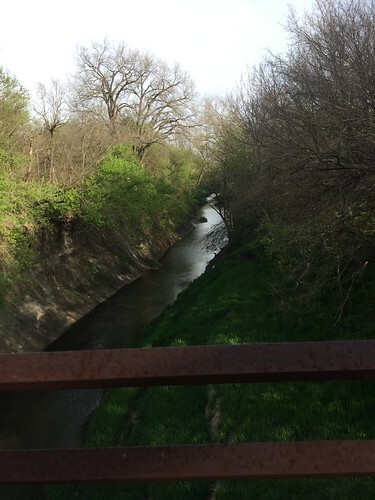 Last year, I was charmed by the fact that I ran past several places I remembered from the early years of our marriage when Darrell and I lived in the area. This year, I noticed less of the charm and more of the fact that A LOT of what I was running through was barren sidewalk. Another disadvantage to running a course again is the loss of the special little joy that comes from not knowing what is around the next corner. That’s one of my favorite parts of running different Disney races – the element of surprise (in nice ways, not evil uphill finish ways). I think I’ll stick to a mix of “one and done” and repeat races, just because there are advantages to both approaches and frankly, most of my “one and done” have been races I traveled too. Cost makes it hard to get back and repeat those very often. 🙂 Despite the fact that this course lost a little of its charm for me, I still think it’s a nice little local race and a good time of the year for me to get moving in the winter so I’ll likely keep running it. 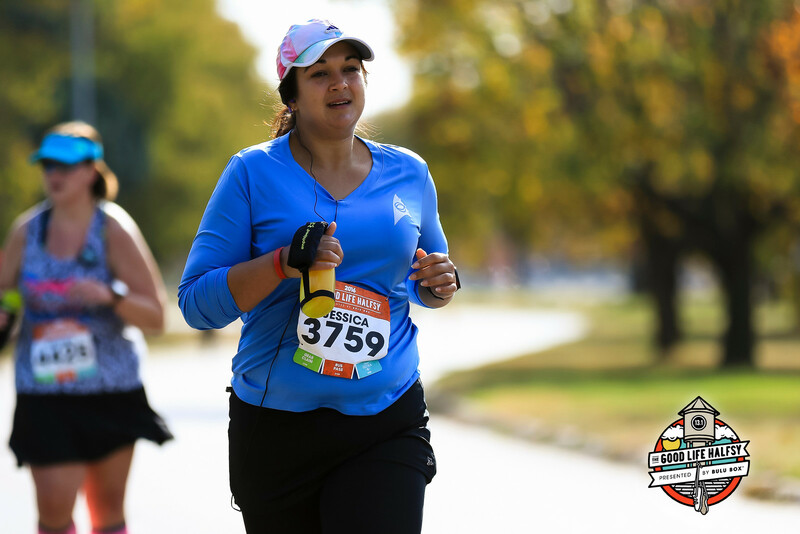 I also just added a new race to my schedule that’s likely going to be a “one and done” because of its location – the Flying Pig half marathon (and 5K and 10K) next May. 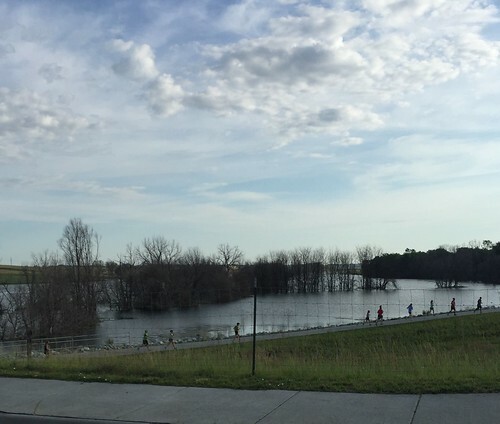 The mix of old and new keeps things interesting (and training for the hills of the Papillion Half Marathon will definitely help with the hilly Flying Pig course!). Do you tend to run the same races over and over or do you mix it up? 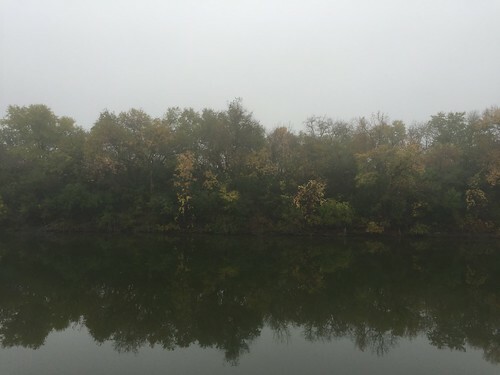 I’ve run two different 5K’s in the last couple of weeks and they were VERY different experiences. 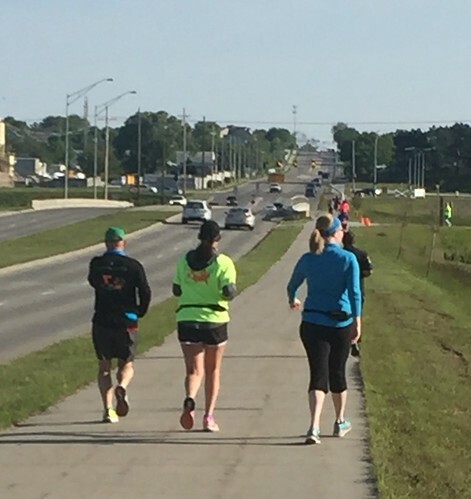 The first, the Run to Remember 5K in Omaha, came across my radar thanks to the Omaha Running Club’s Facebook feed. It was a weekend I was home and it had been ages since I’d done a 5K, so I signed up. I confess I was a little wary once I started getting bombarded with emails about the teams running the event – apparently, this was largely a team focused event, with families and groups who’d lost someone to car vs pedestrian accidents. I wasn’t sure how awkward it would be to run this as a solo runner, but it fit my training plan so I headed out and it ended up being not quite as bad as I thought. 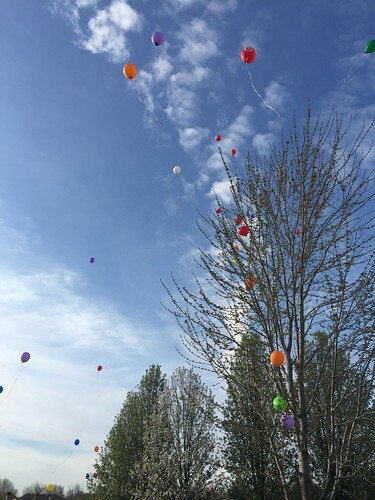 There were lots of families present, which I always enjoy, and a balloon release that was beautiful (if environmentally unfriendly) on a gorgeous spring morning. There wasn’t really a starting line – we just all started going at some point. As we were in grass and I was stuck behind a bunch of walkers, strollers and dogs, it took a minute or two to find some space to run. Once I was clear of the group, we were on sidewalks for an out and back course. There were a couple of little hills, but nothing too bad. I enjoyed running around families with children and through a park full of little soccer players. 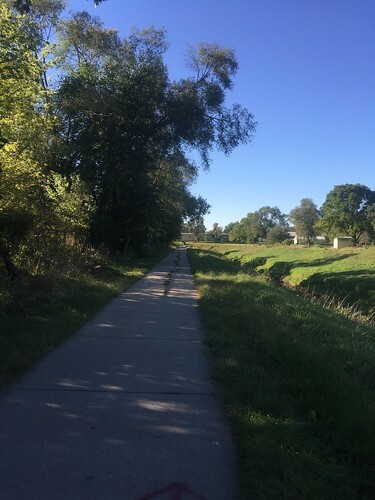 It was occasionally crowded, but not too bad and I was able to stick to my 2 minute run/30 second walk intervals for my tempo workout like I’d planned. After two miles, those intervals felt HARD! This was a much harder effort than I was anticipating and I’m not sure why. We headed over a pretty little bridge and then turned back for the start. The race finished on the high school track, with a narrow finishing chute since this wasn’t chip timed and I confess: I kicked past someone at the end. 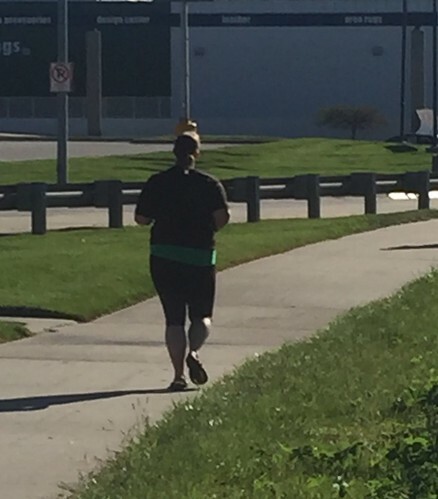 I felt a little bad passing her, but my legs felt it and it wasn’t like I was SUPER close to her. I finished in around 36 minutes, with my last two miles sub-11:30 per the Garmin, which is on target for my tempo runs. 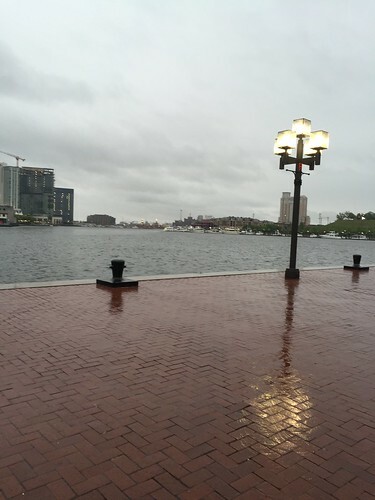 Sunday, I ran a totally different 5K, here at the research meeting I’m attending in Baltimore. I decided that I’d run this without a Garmin because it was cold and rainy, so I’d be worried about my footing more than my pace. I was going to take it easy and count it as my easy 4-5 miles for the day since it was a half mile walking over to the start. I lined up toward the back of the pack and gratefully started running so I could warm up a bit. It was 50 degrees, windy and rainy so I was freezing while waiting at the start! This was a small race, so there were no water stations or mile markers and as I went along, I eventually realized “hey, I’ve been running for quite a while here!” I confess that part of my original motivation to run without a walk break was because there was a much older woman running in front of me. 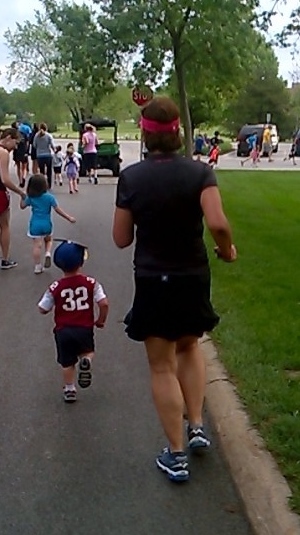 I was determined to run longer than her and figured once I got well past her, I’d walk. However, once I got past her, I realized I still had the ability to run in me so I kept it up. I was careful when the road changed under me (bricks and cobblestones and curbs to normal sidewalk and a slick boardwalk) but at no point did I stop to walk. It was a flat path for the most part, which helped, and the Hamilton soundtrack was keeping me company, so I kept going. Soon enough, the evil uphill finish was in sight and I finished. I finished in 33:13, with a 10:41 pace (and frankly, since it was a gun start / chip finish and I was at the back of the starting pack, I was a few seconds faster than that). At no point during this race did I feel like I was pushing as hard as I did in the Run to Remember 5K that I ran with a eye on my pace and my effort, but still somehow slower. Isn’t it funny how that works about sometimes? The faster 5K was by far the easier effort run. 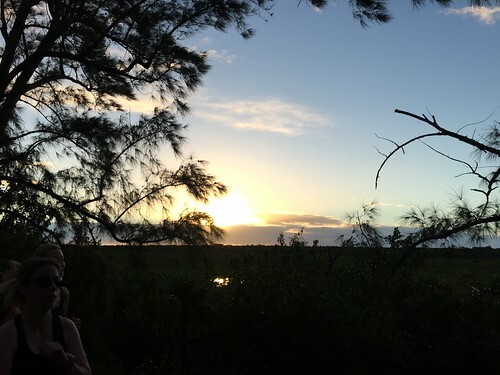 Maybe it was the flatness or the weather or the peanut butter pie I’d had for dessert the night before – or maybe it was the fact that I was running naked, with no watch and no pressure. Side note: Others wearing a Garmin assured me it was the right length course. It’s definitely something to consider and definitely makes me wonder what kind of 5K I could run on a flat course if I really tried, but that’s a goal for another year. Do you run faster without a GPS or specific goal? Or do you find that you need the “push” of constant data?